Patients with Sjögren's syndrome (SS) have characteristic lymphocytic infiltrates of the salivary glands. To determine whether the B cells accumulating in the salivary glands of SS patients represent a distinct population and to delineate their potential immunopathologic impact, individual B cells obtained from the parotid gland and from the peripheral blood were analyzed for immunglobulin light chain gene rearrangements by PCR amplification of genomic DNA. The productive immunglobulin light chain repertoire in the parotid gland of the SS patient was found to be restricted, showing a preferential usage of particular variable lambda chain genes (Vλ2E) and variable kappa chain genes (VκA27). Moreover, clonally related VL chain rearrangements were identified; namely, VκA27–Jκ5 and VκA19–Jκ2 in the parotid gland, and Vλ1C–Jλ3 in the parotid gland and the peripheral blood. Vκ and Vλ rearrangements from the parotid gland exhibited a significantly elevated mutational frequency compared with those from the peripheral blood (P < 0.001). Mutational analysis revealed a pattern of somatic hypermutation similar to that found in normal donors, and a comparable impact of selection of mutated rearrangements in both the peripheral blood and the parotid gland. These data indicate that there is biased usage of VL chain genes caused by selection and clonal expansion of B cells expressing particular VL genes. In addition, the data document an accumulation of B cells bearing mutated VL gene rearrangements within the parotid gland of the SS patient. These results suggest a role of antigen-activated and selected B cells in the local autoimmune process in SS. Sjögren's syndrome (SS) is a chronic inflammatory disease preferentially involving the lacrimal and salivary glands. Patients with SS are characterized by keratocon-junctivitis sicca and xerostomia. Although the cause of the disease is unknown, histopathologic findings suggest an essential role of lymphocytic infiltrates that accumulate in the affected glands. Exogenous antigens and autoantigens have been suggested as potential triggers of the immune response in the salivary glands in genetically and hormonally susceptible individuals [1, 2]. Whereas glandular tissue destruction has been shown to be mediated by activated CD4+ T cells that home into the lacrimal gland , autoantibodies directed against Ro(SS-A) and La(SS-B) autoantigens as well as IgG (rheumatoid factor) are detectable in high titers in about 80–95% of sera from SS patients. This suggests an important role for autoantibodies in this disease . Moreover, a 44-fold increased risk for the development of lymphoid malignancy, almost exclusive of B-cell origin, has been documented in SS, emphasizing the intimate role of activated proliferating B cells in this condition . Whether B-cell activation is a primary cause or a secondary effect in SS is not known. Structures resembling germinal centers have been detected in the salivary glands of patients with SS [3, 6], but it is not known whether the microenvironment of these cell clusters is sufficient for the induction of a germinal center response. Of note, however, recent studies have reported that B cells obtained from the salivary glands or lymph nodes of patients with SS have mutated V gene rearrangements, suggesting an antigen-driven local immune response [6, 7]. To examine the nature of the local B-cell responses in SS in more detail, the present study compared a population of individual B cells obtained from the parotid gland and peripheral blood B cells in a patient with SS by analyzing nonproductive and productive light chain gene rearrangements amplified by PCR from genomic DNA. As a result, a number of differences became apparent between parotid gland B cells and peripheral blood B cells of this patient. In the parotid gland, the productive light chain repertoire was found to be restricted, showing a preferential usage of particular Vλ and Vκ genes, some of which were clonally related. Moreover, productive VL rearrangements showed a significantly higher mutational frequency compared with the patient's peripheral blood, with an increased number of silent mutations in the complementary determining regions (CDR) and framework regions (FR) resulting in a somewhat decreased replacement to silent (R/S) ratio in the VL gene repertoire of parotid gland B cells. Of note, Vλ rearrangements showed a significantly higher mutational frequency, but no significant difference in R/S ratio compared with Vκ rearrangements. These findings indicate that the B cells in the parotid gland of SS patients represent a unique population that may result from a local antigen-driven immune response. Peripheral blood B cells and B cells obtained from the parotid gland of a patient fulfilling the revised criteria for classification of SS  were analyzed. The patient was a 76-year-old female who manifested a typical histology of the minor salivary glands (focus score >1). The duration of the disease was 9 years at the time of analysis. The patient expressed elevated titers of anti-52 kDa Ro(SS-A) and anti-52 kDa La(SS-B) antibodies, had marked hypergammaglobulinemia, and was rheumatoid factor (RF) positive. The patient did not have extraglandular organ manifestations besides leukopenia (3.6 × 109 μl), and she was taking 400 mg hydroxychloroquine and 2 mg prednisone daily at the time of analysis. After developing parotid gland enlargement, lymphoma of the parotid gland was excluded by partial parotidectomy and histological examination. After approval by the local ethics committee and informed consent from the patient were obtained, peripheral blood and parotid tissue were further processed for B-cell analysis. FACS sorting of individual B cells and the method of PCR amplification of VL chain gene rearrangements have been reported in detail recently [9–11]. In the present study, 188 individual peripheral CD19+ B cells were analyzed. To obtain a cell suspension from the parotid gland, fresh tissue samples (about 1–2 cm3) were washed immediately in heparinized medium (RPMI 1640; Biochrom KG, Berlin, Germany), minced with scissors, and subsequently pressed in a tissue hand-homogenizer (NeoLab, Heidelberg, Germany). Following suspension (1:4; v/v) in PBS (pH7.4), the homogenate was sequentially sieved through nylon cell strainers with 100 and 40 μm mesh (Falcon; Becton Dickinson, Franklin Lakes, NJ, USA), removing soft tissue fragments. For separation of mononuclear cells, the cell suspension was centrifuged over a ficoll hypaque gradient, and washed in PBS. Staining with monoclonal anti-CD19 antibodies and FACS sorting of individual B cells were carried out as previously described for peripheral blood B cells [9–11]. A total of 188 individual CD19+ B cells obtained from the parotid gland were analyzed. Immunoglobulin VL chain rearrangements from the peripheral blood of two healthy normal donors (26 and 45 years old) analyzed previously [10, 11] were used for comparison. Both the nonproductive and productive repertoires of these donors exhibited a comparable usage of Vκ and Jκ as well as Vλ and Jλ gene elements [10, 11]. The PCR error rate for this analysis has been documented to be approximately 1 × 10-4 mutations/base . Few if any of the nucleotide changes encountered in this analysis can thus be ascribed to amplification errors. Sequences were analyzed using the V BASE Sequence Directory  to identify the underlying germline gene. Nonproductive as well as productive VL chain rearrangements of peripheral blood B cells of the patient were compared with those of B cells obtained from the parotid gland. We further compared nonproductive as well as productive light chain rearrangements of peripheral blood B cells from the patient and those of normal controls. Sequences were analyzed with Fisher's exact test to compare the differences in the distribution of particular VL gene segments, whereas mutational frequencies and R/S ratios were compared using the chi-square-test. P ≤ 0.05 was considered statistically significant. Mutations within each codon were analyzed and expressed as the percentage of individual codons with replacement or silent mutations. Mutational 'hot spots' were identified in the nonproductive and productive repertoires by determining the mean number of mutations of each codon, and by identifying codons that contained mutations greater than the mean ± 1.96 standard deviations (95% confidence interval) . Sequences have been submitted to the EMBL database: Vκ gene rearrangements from peripheral blood B cells, accession numbers AJ 426144–AJ 426222; Vκ gene rearrangements from parotid gland B cells, accession numbers AJ 426223–AJ 426297; Vλ gene rearrangements from peripheral blood B cells, accession numbers AJ 426298–AJ 426378; and Vλ gene rearrangements from parotid gland B cells, accession numbers AJ 426379–AJ 426416. In the present study, 75 VκJκ gene rearrangements (23 nonproductive and 52 productive) and 38 VλJλ rearrangements (nine nonproductive and 29 productive) were amplified and sequenced from individual B cells obtained from the parotid gland. They were compared with 79 VκJκ gene rearrangements (40 nonproductive and 39 productive) and 81 VλJλ rearrangements (27 nonproductive and 54 productive) obtained from the peripheral blood of the same patient. Analysis of the usage of individual Vλ genes in the productive Vλ gene repertoires revealed a significantly higher frequency of the Vλ2E segment in the parotid gland compared with the peripheral blood of the SS patient (21% versus 4%, P < 0.05). Furthermore, the Vλ7A gene was over-represented in the patient's peripheral blood compared with the frequency found in normal controls (15% versus 2%, P < 0.005) (Fig. 1). Clonality of neither Vλ2E nor Vλ7A was detected. Rearrangements using the Vλ1C gene were frequently found in the parotid gland (17%) and in the patient's peripheral blood (11%), but this gene was not significantly over-represented in peripheral blood B cells of the patient compared with normal donors. Four Vλ1C–Jλ3 rearrangements (two in the peripheral blood and two in the parotid gland) appeared to be related. They showed an almost identical Vλ–Jλ joining region as well as CDR3 composition with three nucleotide changes in the parotid gland rearrangements which were probably related to the process of somatic hypermutation (Fig. 2). Distribution of individual Vλ genes in B cells from the peripheral blood and from the parotid gland of a patient with Sjögren's syndrome (SS) compared with those of normal healthy subjects (NHS). The Vλ gene usage of normal donors is published elsewhere . Vλ genes are arranged starting with the genes located within the A-cluster of the Vλ locus (J-proximal). The significant differences in the frequency of occurrence of 3H (P < 0.05)/7A§ (P < 0.05)/1G* (P < 0.005)/10A° (P < 0.005) gene rearrangements comparing the nonproductive and productive Vλ gene repertoire suggest processes of positive and negative selection of these Vλ gene segments. Vλ1c–Jλ3b rearrangements obtained from the peripheral blood (D10IVL1F9 and D10IIVL1E12) and from the parotid gland (PaIVL1E11 and PaIVL1G12) of the patient with Sjögren's syndrome. Analysis of individual Vκ genes in the nonproductive repertoire revealed a higher usage of the Vκ gene segment A27 in the parotid gland (10%) versus that in the patient's peripheral blood (0%) (P < 0.05). Moreover, the Vκ gene B2 was found significantly more frequently in the gland (24%) than in the peripheral nonproductive repertoire (3%) (P < 0.005). Further analysis of the distribution of individual Vκ genes in the productive Vκ gene repertoire revealed a significantly higher frequency of the gene A27 in the parotid gland of the patient (29%) compared with that in the peripheral blood (8%, P < 0.05) (Fig. 3). In the parotid gland, two out of 15 rearrangements using A27 were clonally related (see later). A second Vκ rearrangement employed A19 with three mutations, shared the same CDR3 and, therefore, appeared to be clonally related (see later). Distribution of individual Vκ genes in B cells from the peripheral blood and from the parotid gland of a patient with Sjögren's syndrome(SS) compared with those of peripheral blood B cells from normal healthy subjects (NHS). # The significant difference in the frequency of occurrence of VκB2 comparing the nonproductive and productive Vκ gene repertoire suggests negative selection of this gene segment (P < 0.005). Vκ gene usage of normal donors has been published elsewhere . Vκ genes are arranged in order from J-proximal to J-distal. In contrast to the observed differences in the VL gene usage, genes were used comparably in the parotid JL gland and the peripheral blood. A predominant Jκ2 usage was found in the nonproductive repertoire (65%) as well as the productive repertoire (59%) of peripheral blood B cells from the SS patient and the parotid gland (70 and 65%, respectively) as compared to all remaining Jκ gene families in the nonproductive (Jκ1, 4%; Jκ3, 0%; Jκ4, 0%; Jκ5, 26%) and productive (Jκ1, 10%; Jκ3, 4%; Jκ4, 2%; Jκ5, 19%) repertoires of the parotid gland and the nonproductive (Jκ1, 5%; Jκ3, 0%; Jκ4, 8%; Jκ5, 23%) and productive (Jκ1, 18%; Jκ3, 8%; Jκ4, 0%; Jκ5, 15%) repertoires of peripheral blood B cells of the patient. Furthermore, Jλ2/3 genes were used predominantly in the productive and nonproductive repertoires of the peripheral blood (85 and 89%, respectively), and exclusively in nonproductive rearrangements and in 80% of the productive rearrangements of the parotid gland. Other Jλ gene families were used rarely by nonproductive rearrangements of the peripheral blood (Jλ1, 7%; Jλ7, 4%) but not by nonproductive rearrangements of the gland and by productive rearrangements of the peripheral blood (Jλ1, 0%; Jλ7, 7%) and the parotid gland (Jλ1, 0%; Jλ7, 7%). Two out of 15 VκA27 rearrangements obtained from the parotid gland B cells were rearranged to Jκ5 and showed sequence homology. The rearrangements had a CDR3 of seven amino acids and a total of 16 mutations with a R/S ratio of 12:1 (four replacement mutations in CDR1, three replacement mutations in CDR2, one replacement mutation in CDR3, two replacement mutations in FR2, and two replacement mutations and one silent mutation in FR3). Two clonally related rearrangements from the parotid gland B cells employed VκA19 and Jκ2, had a CDR3 of nine amino acids, and shared three replacement mutations (one in CDR1, and two in FR2 each). 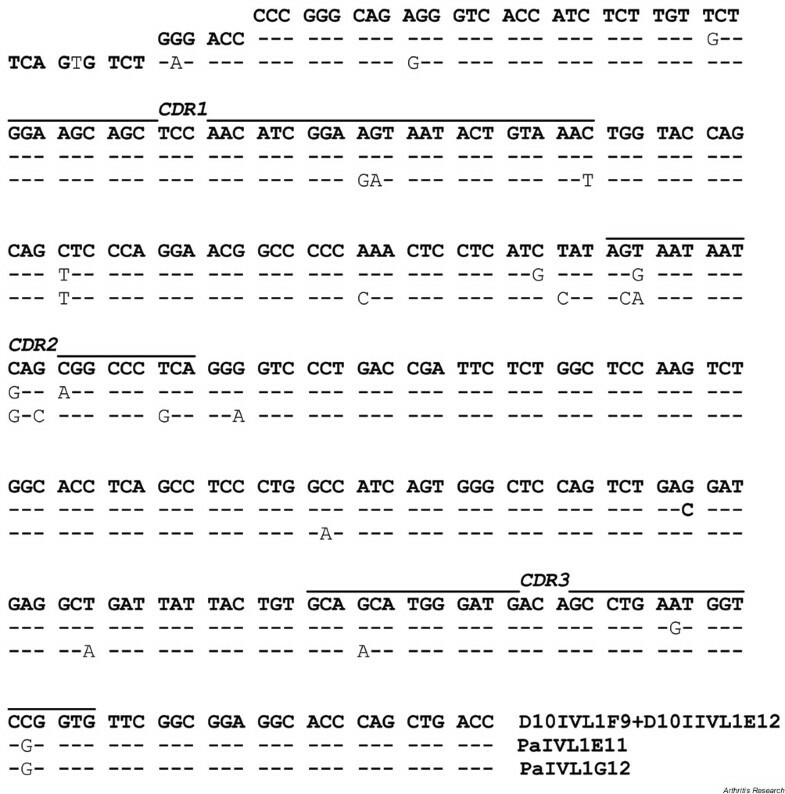 Finally, two rearrangements from the parotid gland and two from peripheral blood employed Vλ1C–Jλ3, and they shared an almost identical CDR3 (11 amino acids) (Fig. 2). However, the rearrangements from the blood were unmutated whereas the rearrangements from the parotid gland B cells had 18 and seven mutations, respectively, which were corresponding only in part. One of these rearrangements had a R/S ratio of 11/4 (3/0 mutations in FR1, 3/1 mutations in FR2, 1/2 mutations in FR3, 1/1 mutations in CDR1, 2/0 mutations in CDR2, and 1/0 mutations in CDR3), with 8/16 (50%) mutations in RGYW/WRCY motifs. The other rearrangement had a R/S ratio of 6/0 (one replacement mutation in CDR1, three replacement mutations in CDR2, and two replacement mutations in FR2), with 2/7 (28.5%) in RGYW/WRCY quartet sequences, respectively. In contrast, no preferential VL gene usage was found in normal healthy subjects. Vλ gene rearrangements. The frequency of mutated nonproductive Vλ genes was very similar in the SS patient (peripheral blood and parotid gland) and in normal controls (49–55%) (Table 1). * Significant difference between the mutational frequency found in the nonproductive versus the productive Vλ gene repertoire (χ2 test). †P < 0.01 and ‡P < 0.001, significant difference between the mutational frequency of the nonproductive and productive, respectively, Vλ gene rearrangements of B cells from the peripheral blood and the parotid gland of a patient with SS. §P < 0.05, significant difference between the mutational frequency of the nonproductive Vλ gene rearrangements of peripheral blood B cells from the patient with SS and of normal donors. Productive Vλ gene rearrangements obtained from the patient's parotid gland were mutated at a higher frequency (83%) compared with those of the patient's peripheral blood B cells (56%). Peripheral blood B cells of the SS patient and of normal controls (58%), however, were mutated at a comparable rate. Vκ gene rearrangements. The frequency of mutated nonproductive Vκ genes was somewhat lower in parotid gland B cells from the patient compared with the peripheral blood (17% versus 38%, respectively), but was comparably high in peripheral blood B cells of the patient with SS (38%) and normal healthy donors (24%) (Table 2). The frequency of mutated nonproductive Vκ genes (17%) was lower in the gland than the frequency of mutated nonproductive Vλ genes (55%). As in Vλ gene rearrangements, a greater frequency of productive Vκ gene rearrangements from parotid gland B cells was mutated (86%) compared with peripheral blood B cells (54%) (P = 0.002). * Significant difference between the mutational frequency found in the nonproductive versus the productive Vκ gene repertoire (χ2 test). †P = 0.005 and ‡P < 0.001, significant differences in the mutational frequency of the productive Vκ gene rearrangements of B cells from the peripheral blood compared with the parotid gland of a patient with SS or with normal donors. §P < 0.001, significant difference between the mutational frequency of the nonproductive Vκ gene rearrangements of peripheral blood B cells from the patient with SS and of normal donors. Vλ gene rearrangements. The nonproductive Vλ gene rearrangements (0.76% versus 0.33%, P < 0.01) and the productive Vλ gene rearrangements (3.32% versus 0.97%, P < 0.001) of parotid gland B cells showed significantly greater mutational frequencies than Vλ gene rearrangements of peripheral blood B cells. 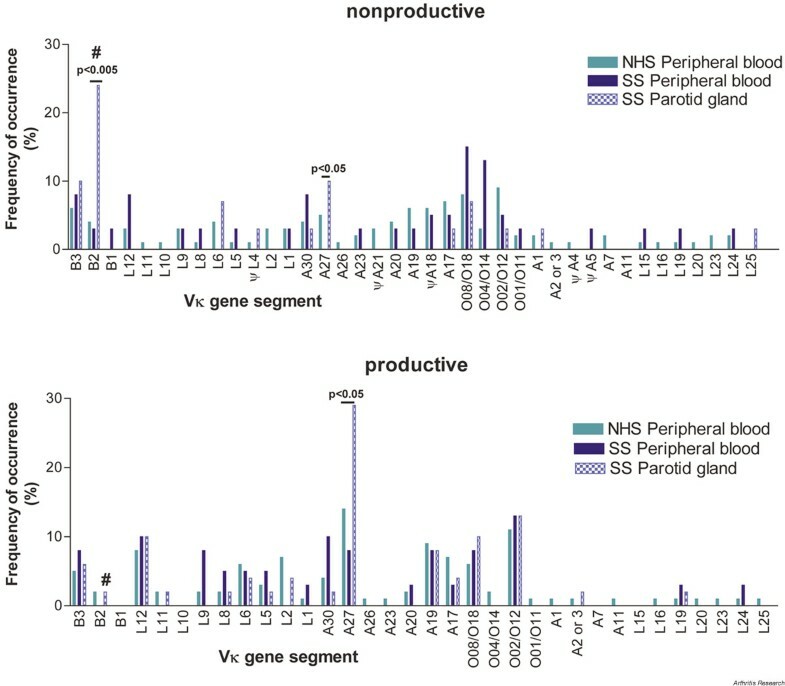 Moreover, nonproductive Vλ genes from the parotid gland exhibited a significantly lower mutational frequency compared with productive Vλ gene rearrangements (0.76% versus 3.32%, P < 0.001). As observed in B cells from the parotid gland, peripheral blood B cells of the patient (0.97% versus 0.33%, P < 0.001) and of normal donors (1.12% versus 0.60%, P < 0.001) also showed a greater mutational frequency in productively rearranged Vλ genes compared with nonproductive Vλ gene rearrangements. Vλ2E was frequently used in productive Vλ gene rearrangements obtained from the parotid gland of the SS patient. The mutational frequency of productive Vλ2E gene rearrangements from parotid gland B cells (3.65%) was twice as high as that of productive Vλ2E gene rearrangements from the peripheral blood of the patient (1.80%, P = 0.052). Similar results were obtained when comparing the mutational frequency of productive Vλ1C gene rearrangements from the parotid gland (3.65%) with that of Vλ1C gene rearrangements from the peripheral blood (0.27%, P < 0.001). 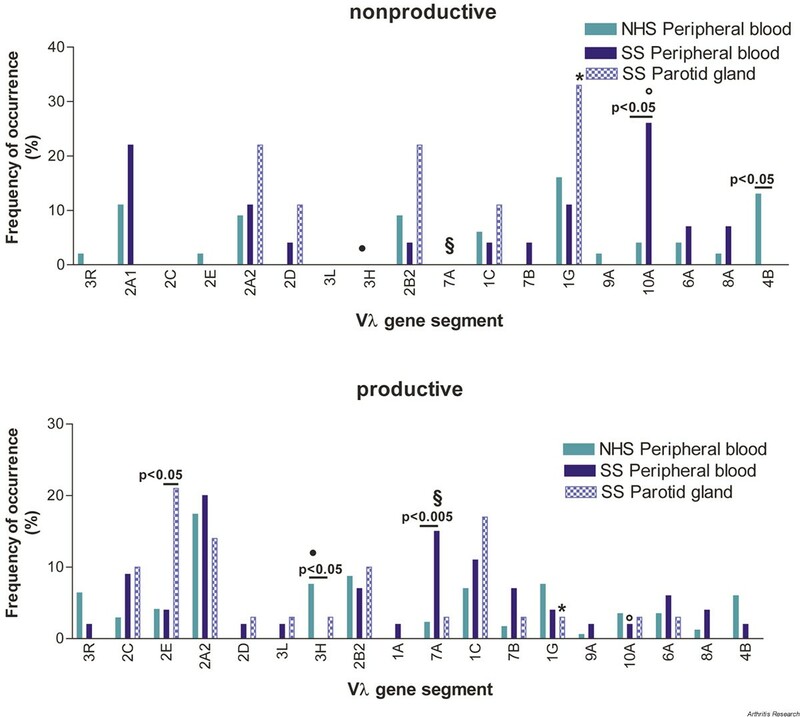 In contrast to these findings, productive Vλ7A gene rearrangements found to be over-represented in the peripheral blood only of the patient exhibited a lower mutational frequency (0.38%) than other productively rearranged Vλ genes in the peripheral blood (1.06%, P = 0.005) or in the parotid gland (Vλ7A, 0.74%, P = 0.385; remaining Vλ gene rearrangements, 3.42%, P < 0.001) of the patient with SS. Vκ gene rearrangements. Productive Vκ gene rearrangements from the parotid gland of the patient exhibited a significantly greater mutational frequency than productive Vκ gene rearrangements from the peripheral blood (2.35% versus 0.77%, P < 0.001). A significantly lower mutational frequency of productive Vκ gene rearrangements of peripheral blood B cells (0.77%) was identified in the patient with SS compared with normal healthy donors (1.08%, P = 0.005). In contrast, nonproductive Vκ gene rearrangements of parotid gland B cells were mutated at a similar frequency as those from the patient's peripheral blood. Notably, in the productive repertoire of parotid gland B cells, there was a significantly greater mutational frequency in Vλ rearrangements than in Vκ rearrangements (3.32% versus 2.35%, P < 0.001). In contrast, Vλ and Vκ gene rearrangements from the peripheral blood B cells exhibited a comparable mutational frequency. The mutational frequency of productive rearrangements using VκA27 from the parotid gland was significantly higher (3.89%) than that of the remaining productive Vκ gene rearrangements in the parotid gland (1.85%, P < 0.001) or that of the VκA27 gene rearrangements from the patient's peripheral blood (0.45%, P < 0.001). Notably, the two clonally related VκA27–Jκ5 rearrangements had a mutational frequency of 7.3% (16/219). Because of the significant differences in the mutational frequencies of productively rearranged VL genes from the peripheral blood and from the parotid gland of the SS patient, further analysis addressed the nature of these mutations. The R/S ratio of the nonproductive Vκ and Vλ repertoire could not be assessed individually because of the small number of mutations in the nonproductively rearranged VL genes of the SS patient. 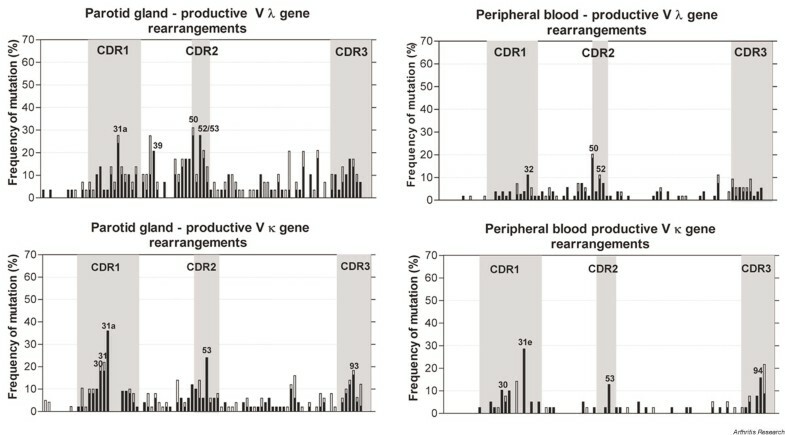 The overall R/S ratios of all nonproductive VL gene rearrangements, however, were 2.9 (29/10) (CDR, 3.3 [13/4]; FR, 2.7 [16/6]) for the peripheral blood B cells and 5.7 (17/3) (CDR, 7.0 [7/1]; FR, 5 [10/2]) for the parotid gland B cells. Comparison with the respective R/S ratios of the nonproductive and productive repertoires revealed only a significant difference of the ratios in the FR of peripheral blood B cells (2.7 versus 1.9, P < 0.024). Despite striking differences in the mutational frequency of the productive VL gene rearrangements from the parotid gland and the peripheral blood of the patient, there was no significant difference in the R/S ratios. Comparison of the R/S ratio in the peripheral blood of the patient and of normal donors also revealed no major differences (Tables 3 and 4). No significant difference was again found when the R/S ratios of the CDR of all VL rearrangements (5.4 [98/18] of peripheral blood versus 3.7 [188/51] of the parotid gland) were compared between the two compartments. Because of the small number of mutations exhibited by nonproductively rearranged Vλ genes of B cells from the parotid gland and from the peripheral blood, only productive Vλ rearrangements were analyzed. FR, framework regions; CDR, complementary determining regions. * Statistical difference between the R/S ratio of productively rearranged Vλ genes from the parotid gland versus peripheral blood from a patient with SS (ns, not significant). Because of the small number of mutations exhibited by nonproductively rearranged Vκ genes of B cells from the parotid gland and from the peripheral blood, only productive Vκ rearrangements were analyzed. FR, framework regions; CDR, complementary determining regions. * Statistical difference between the R/S ratio of productively rearranged Vκ genes from the parotid gland versus peripheral blood from a patient with SS (nd, not determined; ns, not significant). Further analysis addressed the distribution of the mutations in productively rearranged VL genes. A similar pattern of mutational 'hot spots' was noted in parotid gland and peripheral blood productive rearrangements (Fig. 4) despite the significantly higher mutational frequency in VLgene rearrangements of the parotid gland. 'Hot spots' of replacement mutations were almost exclusively located within the CDR. Frequency of replacement mutations (black) and silent mutations (white) of each codon of productively rearranged VL genes of B cells isolated from peripheral blood and from the parotid gland of a patient with Sjögren's syndrome. The frequency of mutation of each codon is calculated as the percentage of sequences that contain mutations in particular codon positions. Mutational 'hot spots' of replacement mutations are shown. Nonproductive VL genes were not analyzed because of the small number of mutations. CDR, complementary determining regions. Vλ gene rearrangements. With regard to replacement mutations, codon position 39 represented a mutational 'hot spot' within FR2 in productive Vλ gene rearrangements obtained from the parotid gland (6/29). In more detail, four Vλ1C gene rearrangements exhibiting a replacement mutation at this codon position, causing a replacement of leucine (CTC) by phenylalanine (TTC), seemed to be selected positively in the gland. A large number of silent mutations was observed within the FR2 and FR3 of productive Vλ gene rearrangements of the parotid gland. Vκ gene rearrangements. Mutational 'hot spots' of replacement mutations were located exclusively in the CDR. Within the FR2 (codon position 45) and FR3 (codon positions 77 and 87) of productive Vκ gene rearrangements from the parotid gland B cells, an accumulation of silent mutations was observed consistent with the findings in the productive Vλ gene repertoire of parotid gland B cells. To characterize the pattern of somatic hypermutation of the VL gene rearrangements of B cells from the patient's peripheral blood and the parotid gland in more detail, the contribution of mutations within the previously described highly mutable motif RGYW and its inverse repeat, WRCY, was determined . Vλ gene rearrangements. There was no significant difference in the occurrence of the highly mutable quartets in the germline (8.1–8.8% of quartets) in the nonproductive as well as the productive Vλ gene rearrangements of B cells from the peripheral blood or from the parotid gland of the SS patient. In the nonproductive repertoire of peripheral blood and parotid gland B cells, respectively, 18.2% (4/22) and 23.5% (4/17) of all mutations were within RGYW/WRCY motifs. In the productive repertoire, however, this percentage was significantly increased, with 45.0% (59/131, P = 0.018) and 48.1% (117/243, P = 0.049), respectively (Table 5), indicating a lack of targeting of highly mutable motifs but considerable selection of mutations in these motifs. Significant difference of the contribution of mutations of RGYW/WRCY sequences to all mutations comparing nonproductive and productive Vλ gene rearrangements: *P = 0.018 (chi-square test), peripheral blood B cells from the patient with SS; †P = 0.049, B cells from the parotid gland; and ‡P < 0.0001, B cells from the peripheral blood of NHS . Vκ gene rearrangements. As in Vλ gene rearrangements, there was no significant difference in the occurrence of the highly mutable quartets in the germline of Vκ gene rearrangements (7.5–8.9% of quartets). In the nonproductive repertoire, mutations within RGYW/WRCY accounted for 50% (10/20) of all mutations in Vκ gene rearrangements of B cells from the peripheral blood. This was significantly more than expected by chance. In contrast, only 20% (1/5) of the observed mutations in nonproductive Vκ gene rearrangements from parotid gland B cells were within these highly mutable motifs. The contribution of RGYW/WRCY mutations to all mutations in the productive Vκ gene repertoire of peripheral blood B cells was comparable with that observed in the corresponding nonproductive repertoire (43.2% [32/74]). In the productive Vκ gene repertoire of the parotid gland B cells, however, RGYW/WRCY mutations made up 50.6% (139/257, P = 0.13) of all mutations (Table 5). Similar as observed for the Vλ repertoire, this suggests a positive selection of these mutations in the parotid gland. The present study has identified a number of differences between parotid gland B cells of a patient with SS compared with B cells obtained from the peripheral blood of the same patient. This patient manifested increased titers of autoantibodies (anti-Ro and anti-La), hypergammaglobulinemia and enlargement of the parotid glands, and could therefore be considered to have active disease. The data provide evidence that B cells that infiltrate the salivary glands in SS were highly selected. The repertoire differences were especially noteworthy in the productive and, therefore, the expressed VL gene repertoire, and they supported the conclusion that the parotid gland B cells were highly selected. B cells from the parotid gland were a distinct population exhibiting significantly elevated mutational frequencies in both productive Vκ and Vλ gene rearrangements, and showing preferential expansion and somatic mutation of particular VL chain rearrangements (VκA27–Jκ5, VκA19–Jκ2 and Vλ1C–Jλ2/3) compared with peripheral blood B cells. Of interest, parotid gland VL gene rearrangements showed an increased number of silent mutations in the productive repertoire with no increase in the R/S ratio compared with the peripheral blood, suggesting that replacement mutations may have been negatively selected from this population. Mutations within RGYW/WRCY sequences appeared to be positively selected in VL gene rearrangements. Altogether, these results indicate that parotid gland B cells in SS represent a unique and highly selected B-cell population. Strong selective influences were detected in the parotid gland of the patient, with B cells that rearranged VκA27, VκA19 and Vλ2E as well as Vλ1C being preferentially expanded. Since these VL genes were not found to be over-represented in the nonproductive VL gene repertoire of the parotid gland, they appeared to result from positive selection. Furthermore, there was evidence of clonal expansion of VκA27–Jκ5 and VκA19–Jκ2 rearrangements in the patient's parotid gland only, as well as of Vλ1C–Jλ3 rearrangements in both the peripheral blood and parotid gland of this patient with SS. One feature of the present patient was that the κ/λ ratio of B cells in the patient's peripheral blood was significantly lower than that found in normal subjects (0.7 versus 1.8) [10, 11]. When the patient's serum was enriched, the κ/λ ratio was found to be 1.77, suggesting that different influences may effect selection of memory B cells versus plasma cells. It is also possible that the reduced κ/λ ratio in the blood represents preferential migration of κ-expressing B cells (e.g. VκA27 and VκA19) from the blood into the parotid gland. Notably, the κ/λ ratio in the parotid gland was 1.8, consistent with this possibility. Positive selection of particular VL chain genes by foreign or autoantigens present in the parotid gland appears to shape the productive VL chain repertoire in the inflamed tissue. A restriction of the VL chain repertoire has been described following vaccination. As an example, antibodies against Haemophilus influenzae B that develop as part of a Th2 response have been identified to be frequently encoded by VκA2, VκO8/O18, VκL11, VκA17, and VκA27 . Moreover, Vλ genes of the Vλ2 and Vλ7 families were found in the Hib-antibody encoding VL gene repertoire . In addition, VκA27 and Vλ2C, Vλ2E, Vλ2A2 or Vλ10A were also shown to encode anti-Streptococcus pneumoniae antibodies . Interestingly, VκA27 and Vλ2E that were frequently found in the parotid gland of this patient, with VκA27 expanded clonally, have also been shown to encode anti-rabies virus antibodies . Microbial antigens, including bacterial and viral epitopes that could be involved in the pathogenesis of SS , could thus also be involved in the selective processes shaping the VL gene repertoires of B cells accumulating in the parotid gland of this SS patient. Also, autoantigens might be involved in the accumulation of parotid gland B cells in this patient. In this regard, VκA27 was frequently used by RFs in patients with rheumatoid arthritis . RF is typically present in sera of patients with SS  and was also detected in the saliva or in salivary gland biopsies  of these patients. In this regard, Martin et al. described two salivary gland lymphomas that developed in SS patients from RF-specific B cells . Moreover, VκA27 has been reported to be frequently employed by lymphomas developing in the gland of SS patients . Despite the presence of clonally expanded B cells expressing VκA27, the current patient did not develop lymphoma during a follow-up period of 3 years after the examination. This observation indicates that additional factors or further persistence of the chronic B-cell proliferation are essential for the development of lymphoma. Histological studies suggest that inflamed ductal epithelial cells represent the focus of the inflammatory response in the salivary glands of patients with SS. There is clear evidence of an inflammatory environment with presentation of self-antigens characteristic of SS  that may permit the production of autoantibodies. Systemic B-cell activation, characterized by hyperimmunglobulinemia and the production of autoantibodies, however, can precede disease manifestations in SS . This suggests the possibility that enhanced migration or homing of activated lymphocytes into the salivary glands from other sites of B-cell activation may play an important role in disease pathogenesis. In this context, activated epithelial duct cells have been shown to secrete specific chemokines, such as SDF-1 (CXCL-12) and BCA-1 (CXCL-13), that are capable of attracting specific B lymphocytes into the glands [22, 23]. H & E staining of the parotid tissue revealed lymphoid follicles as well as diffuse plasma cell infiltration of the organ (Hansen et al., manuscript submitted). This is inline with the assumption that plasma and memory B cells accumulate in the parotid gland but cannot clarify the origin of these cells. Whatever the primary aberration in the induction of the salivary inflammation, one abnormality relates to the generation of ectopic germinal center-like structures in the inflamed glands. Abnormal migration of B cells into the salivary glands could contribute to this process. In contrast to the skewed VL gene repertoire, no differences in the JL gene usage were observed when comparing peripheral blood B cells and parotid gland B cells of the patient. These data rather suggest that selective processes are dependent on the rearranged VL gene. Mutational analysis supported the conclusion that a distinct B-cell subpopulation accumulated in the parotid gland. The mutational frequency and the percentage of mutated light chain genes were greater in the productive VL chain rearrangements of B cells from the parotid gland compared with those from peripheral blood, but they accumulated a large number of silent mutations. Interestingly, productively rearranged Vλ genes of the parotid gland exhibited a significantly greater mutational frequency than the Vκ gene rearrangements. Altogether, in the parotid gland and in the peripheral blood of the SS patient, nonproductive VL chain rearrangements showed a significantly lower mutational frequency than productive VL chain genes, suggesting that mutations were clearly selected. A positive selection of mutations was previously identified in VL gene rearrangements of normal subjects [10, 11], but not in that of a patient with systemic lupus erythematosus [24, 25]. In the parotid gland, expanded B cells expressing VκA27 and Vλ2E as well as clonally expanded VL chains were mutated at a significantly higher frequency compared with the remainder of the repertoire. This finding suggests that B cells bearing particular receptors may have undergone antigen-triggered somatic hypermutation. Several groups have previously described germinal center-like structures in the parotid gland [3, 6]. The parotid gland might therefore be able to act as a secondary lymphoid organ, facilitating somatic hypermutation and selection of antigen-specific B cells. Antigen-driven germinal center reactions might proceed within ectopic lymphoid follicles in the parotid gland, giving rise to highly mutated antigen-specific B cells. On the contrary, migration of highly mutated antigen-specific B cells from the patient's blood to the parotid gland could also contribute to the observed differences in the mutational frequencies. The analysis of somatic mutations of the VL gene rearrangements of the B cells provided evidence of selection against replacement mutations. In addition, the marked increase of RGYW/WRCY mutations in the productive B-cell repertoire of the parotid indicates that positive selection of mutations in these highly targeted motifs occurred in the salivary gland. Selection thus appears to have diminished some mutations while increasing others. The analysis of the R/S ratio and the mutational 'hot spots' of productive VL chain rearrangements of peripheral blood and parotid gland B cells revealed no major abnormalities when compared with normal donors. This indicates intact mechanisms of selection against replacement mutations in the FRs that might cause structural constrains of the immunoglobulin molecule. The frequency of silent mutations was found to be increased in the productive light chain repertoire of B cells from the parotid gland, consistent with a reduced R/S ratio in the CDR and FR. Overall, replacement mutations were selected against in the parotid gland. This is in line with the observations of Gellrich et al., Stott et al. and Miklos et al., who reported a decrease in the R/S ratio in VH gene rearrangements of B cells obtained from the salivary glands of SS patients or in B cells from mucosa-associated lymphoid tissue lymphoma in SS patients. Furthermore, Stott et al. described a decreased R/S ratio in the CDR of VH and VL gene rearrangements of B cells obtained by minor salivary gland biopsies from two patients with SS . Detailed analyses of the frequency of occurrence and mutations of the highly mutable motifs RGYW and WRCY revealed that mutations in nonproductive VLrearrangements of B cells from the parotid gland were less targeted towards RGYW on both DNA strands. These mutations of RGYW on both DNA strands were, however, selected positively in VL gene rearrangements of B cells from the parotid gland. Although no firm conclusion can be drawn, it might be possible that the clear pattern of these targeted mutations is basically generated in the parotid gland of the patient, with particular retention of selected VL rearrangements. Altogether, the influences of selection appeared to be overall intact in the present SS patient. A biased VL gene usage with an over-representation of expanded B cells using VκA27, VκA19, and Vλ1C, a positive selection of mutations (especially within RGYW and WRCY sequences), and indications of selection against R mutations in the VL gene rearrangements were observed in B cells from the parotid gland, compared with peripheral blood B cells, of a patient with SS. The bulk of the data indicate that selective influences shape the VL chain repertoire of B cells in the parotid gland. These data are consistent with the conclusion that the parotid gland hosts a specific B-cell population that may accumulate either by changes of homing patterns or by generating germinal center-like structures in the salivary glands. = variable lambda chain gene.